• Struvite Dissolution helps dissolve all types of struvite stones. 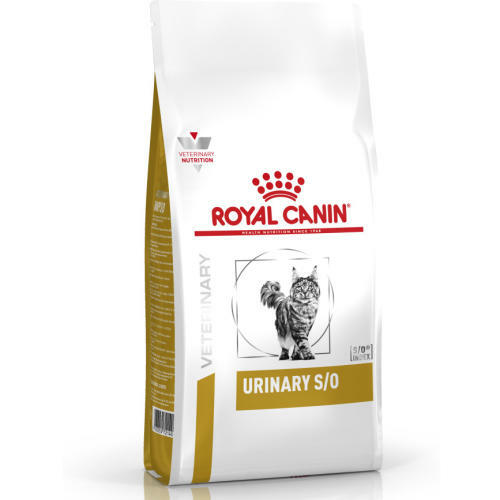 • Urine Dissolution helps make the urine less liable to form struvite and calcium oxalate stones. • Low Magnesium is a natural component of struvite crystals. Rice, wheat gluten**, dehydrated poultry protein, maize flour, animal fats, hydrolysed animal proteins, maize gluten, minerals, vegetable fibres, fish oil, soya oil, fructo-oligo-saccharides, marigold extract (source of lutein). **L.I.P. : protein selected for its very high digestibility. Crude ash: 8.9%. Crude fibre: 2.9%. Crude oil fats: 15%. Protein: 34.5%. Vitamin A: 21500 IU, Vitamin D3: 800 IU, E1 (Iron): 37 mg, E2 (Iodine): 3.7 mg, E4 (Copper): 11 mg, E5 (Manganese): 48 mg, E6 (Zinc): 136 mg, E8 (Selenium): 0.06 mg, Urine acidifying substances: calcium sulphate (1.25%). Preservatives - Antioxidants.